Habet & Habet was established as a partnership in December 1984 after having operated as a branch of their father’s business, Salvador Habet Ltd, for the previous two years. This partnership of brothers, Omar and David Habet, specialized in grocery items, as well as hardware and building materials. Realizing the need for expansion after a few years, the partners purchased property, constructed and relocated to 135 Corner West & Basra Streets. They eventually constructed another building and extended their product lines to include furniture and house wares. After mutually deciding to branch off on their own, the partnership was dissolved, with David keeping the furniture/houseware division and Omar carrying on the business of grocery, hardware and construction supplies. In December 1993, the limited liability company, Habet & Habet Ltd. was formed having two shareholders, Omar Habet & his wife, Gina Habet. 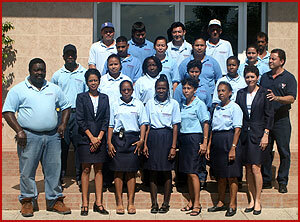 The growth of the business continued and after ten years, in June 2003, the company relocated to a much larger facility at 107 Cemetery Road, Belize City. 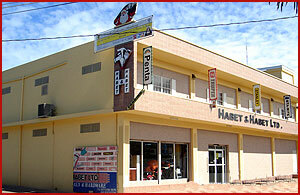 Habet & Habet Ltd continues to be a leader in the hardware/building materials market. Its spacious, computerized, air-conditioned establishment; free parking and delivery; and products at competitive prices account for its ever growing customer support and popularity. In addition, Habet & Habet Ltd has always been a very socially minded business. It continues to assist non-governmental and charitable institutions through financial assistance. Such organizations as the Rotary Club of Belize, Lion’s Club, Mercy Care Center, YMCA, YWCA, Friends of Pediatrics, schools, churches and sporting clubs throughout the country, have been assisted in numerous ways. Several young men and women have also been assisted with part time employment to assist with meeting their educational goals as well as several scholarships have been awarded to needy children in the community.